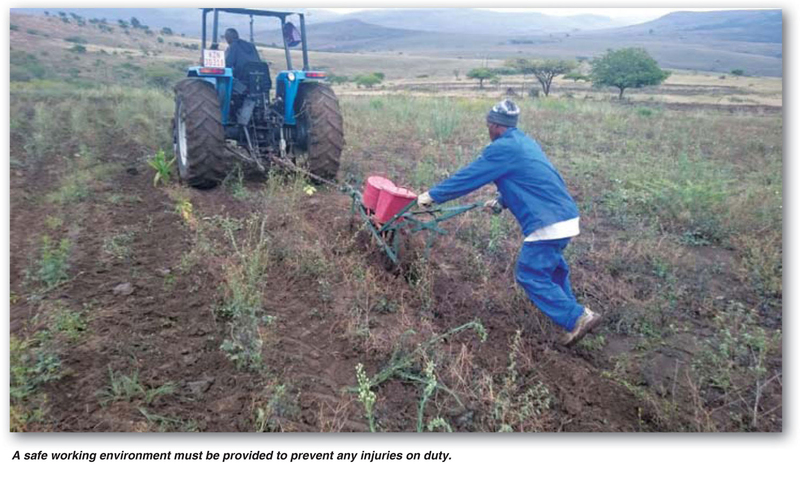 In a previous article we emphasised the fact that farmers as employers must provide and maintain, as far as is reasonably possible, a working environment that is safe and without risk to the health of employees. The Occupational Health and Safety Act (No. 85 of 1993) regulates health and safety in the workplace, being your farm. In the same article, we discussed the responsibilities of the employer where as in this article we will focus on the responsibilities of employees and should incidents (injuries) occur. Take care of his/her own health and safety, as well as that of other people who may be affected by his/her actions. Carry out any lawful and reasonable instruction regarding health and safety issued by the employer. Comply with the employer’s workplace procedures. Use the prescribed personal protective clothing and equipment when required. Report any potential hazard to the employer as soon as possible. Report any incident that can influence his/her health or cause an injury to the employer as soon as possible, but no later than end of the shift. However, it remains the responsibility of the employer to ensure that all employees are aware of the above-mentioned responsibilities. Should an injury occur, and the employer found to be negligent, there could be serious repercussions for the employer. You could be fined a substantial fine and/or face imprisonment and be ordered to rectify the matter. Unqualified repercussions could be that the productivity and attitude of your employees may be affected negatively by regular injuries occurring. For the benefit of the employee and employer it is important, should an incident occur to follow the correct procedure to report any major injury (especially were medical attention is required) or death to the Compensation Commissioner within seven days. An employee has the right to claim any medical expenses from the Commissioner. If the correct procedure is not being followed the employee would have the right to claim compensation from the employer. A fund, the so-called Compensation Fund was established by law, Act No.130 of 1993, Compensation for Occupational Injuries and Diseases Act (COIDA) to provide for compensation for disablement caused by injuries and diseases sustained or contracted by employees during their employment period as a direct result of their occupation. It also compensates for death because of injuries and diseases in the same manner. Employers pay an amount every year (compulsory) to the fund from where these benefits are paid. It is a compulsory insurance cover for employers should any of their employees die, sustain an injury or contract an occupational disease during the period of their employment. The fund is controlled by the Compensation Commissioner and administration of reporting, penalties, collections etc. is handled by the Department of Labour. Please, please note, if you have but only one employee, it is compulsory to register with the Department of Labour to contribute to this fund. A minor incident or injury where no professional medical attention is required need not be reported. However, it will be a good managerial practice to keep a record of such an incident. By keeping the necessary records, you may be able to determine an area of concern or that a specific employee is very negligent. Because you have information, you will then be able to manage the problem. In case of a more severe injury (professional medical attention is required), the incident must be reported to the Compensation Commissioner (Department of Labour) by completing Part A of the Employers Report of an Accident Form WC12. Part B – a carbon copy of part A – must be handed to the employee to give to the doctor or hospital where he/she is treated. The final medical report – also on WCI 5; and then finally the employer must complete the resumption of work report – WCI 6. In case of a very serious incident the employer must demarcate the site with a ribbon, gather as much evidence as possible, take photos, obtain signed statements from eyewitnesses, determine the sequence of events and the cause and apply improvements. In case of a death, the entire site must be left untouched till the police arrive. All forms and information are available from the Department of Labour. Ensure that you always have forms available – it is proper management. Complying with the requirements of the two acts mentioned requires a good deal of administration. But, this is far outweighed by the benefits of creating a safe working environment and the compensation of medical costs and ensuring productivity. Article submitted by Marius Greyling, Pula Imvula contributor. For more information, send an email to mariusg@mcgacc.co.za .